Lemon basil, Thai lemon basil or Lao basil is a hybrid between basil (Ocimum basilicum) and African basil (Ocimum americanum). 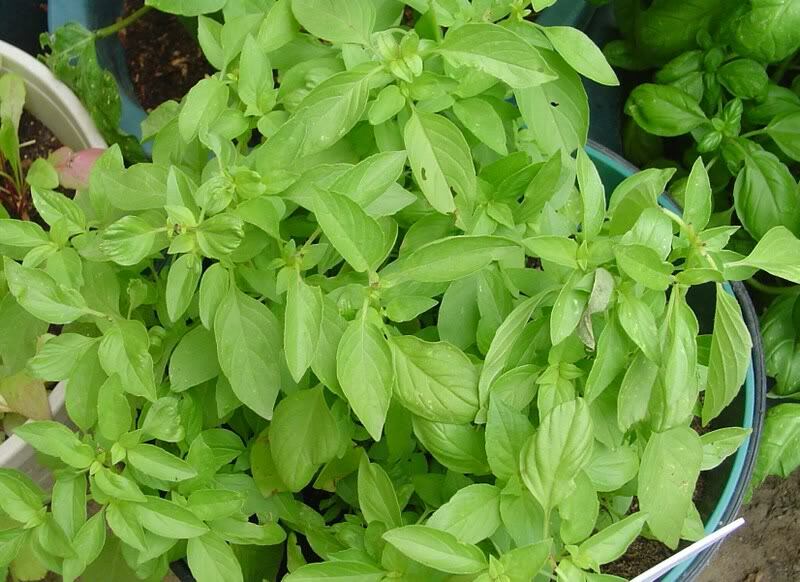 Lemon basil is the only basil used much in Indonesian cuisine, where it is called kemangi. It is often eaten raw with salad or lalap (raw vegetables) and accompanied by sambal. Lemon basil is often used to season certain Indonesian dishes, such as curries, soup, stew and steamed or grilled dishes. In Thailand, Lemon basil, called maenglak, is one of several types of basil used in Thai cuisine. The leaves are used in certain Thai curries and it is also indispensable for the noodle dish khanom chin nam ya. The seeds resemble frog's eggs after they have been soaked in water and are used in sweet desserts.It is also used in North East part of India state Manipur. In Manipur, it is used in curry like pumpkin, used in singju (a form of salad), and in red or green chilli pickles type. Recipes using Lemon Basil see Here and Here.